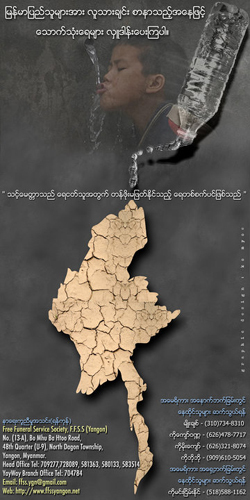 Burma is now facing a shortage of drinking water. Due to the high temperatures this summer, the underground water sources have run dry. The rural and slum areas do not have any pipe water supply and depend on natural water collection in ponds and wells. Burmese social youth groups are trying to solve this problem on their own initiative by not only donating water, but also organizing the logistics. While helping the affected people, they dare not to let others know about it because the government is tracking down everybody for these donations. Groups who want to take water to the affected areas must pay 50,000 Kyat to the government in order to get permission and travel passes. Then the military puts their stickers all over the water shipments to make it look like they are the ones helping the people! 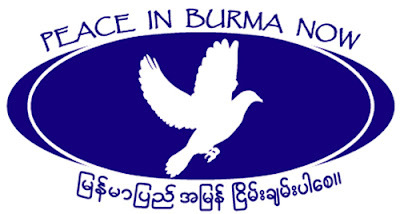 In the area around Pegu (Bago) the people are suffering worst. According to reports from inside sources they are now also facing a severe diarrhea problem. NGOs and UN agencies who want to help cannot reach the areas quickly enough because the military regime is delaying the permission process. Meanwhile the situation is getting worse.